MSNV | A leading independent school in the Washington Metropolitan area. Find out what's ahead for the week when you check out the Morning Minute: April 20, 2019. Keep up to date with what's ahead for the MSNV community through this week's Morning Minute: April 7, 2019. 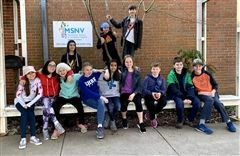 Find out what's in store for the MSNV community when you read the MSNV Newsletter: April 4, 2019. Find out what's happening at MSNV this week when you watch the Morning Minute: March 31, 2019. The Montessori School of Northern Virginia (MSNV) is a leading independent school in the Washington Metropolitan area providing authentic Montessori education for children ages 2 through 12. MSNV admits students of any race, color, national and ethnic origin to all of the rights, privileges, programs, and activities generally accorded or made available to students at MSNV. It does not discriminate on the basis of race, color, national or ethnic origin in the administration of its educational policies, admission policies, tuition assistance programs, and other school-administered programs. MSNV has a responsibility and a role in advocating for a world of love, acceptance, understanding, and inclusion. We empower our community to embrace these values by fostering respectful and compassionate interactions with all people. We aim for our students to embody a profound appreciation and respect for differences and interconnection. The MSNV community moves forward with a commitment to equity, justice, diversity and inclusion.